As an object, lantern is here to provide some light, while this hand-held lighting device has many different meanings and symbols in different cultures. Particularly, in the Chinese tradition, this is a symbol of the warmth of love “lighting the way so that two may see”. Combined with stars, it’s all about wealth and good fortune – and also as a symbol for a new and rewarding progressive jackpot pokie machine. One of the pioneers of modern pokies, IGT started to create world famous software since 1975. In the beginning, they used to power landline casinos, but with the progress of online industry they moved operations online. 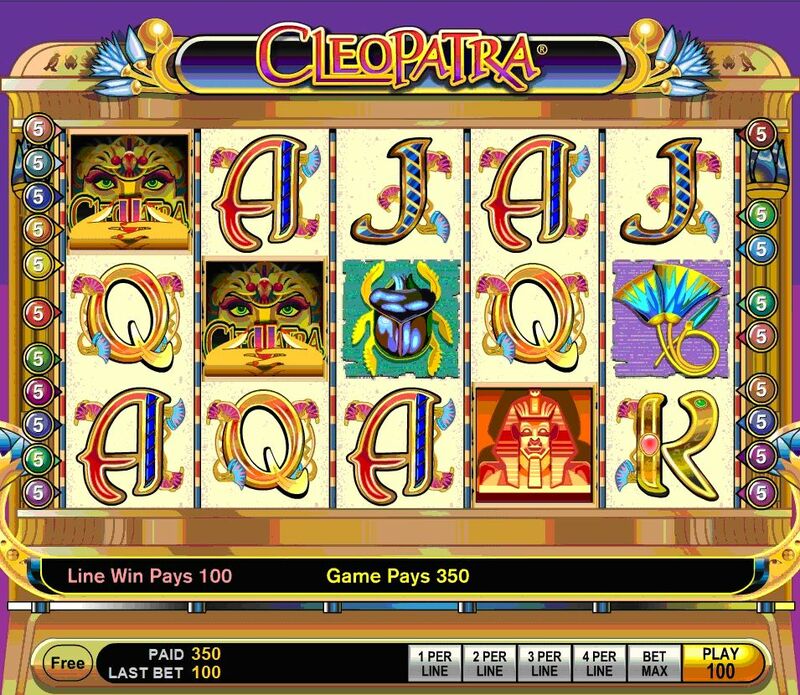 The company is famous for its wide range of games, among which you can find several high-paying progressive jackpots. Star Lanterns is one of those games, now available for a range of modern devices and featuring immerse visual and graphic environment. 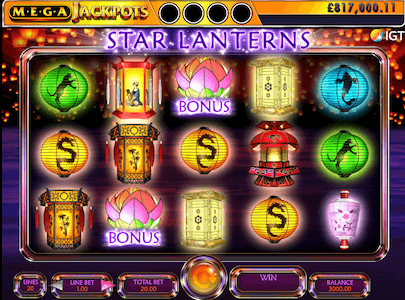 Star Lanterns is a classic video pokie machine with 5 reels and 20 paying lines, flushed with themed icons that appear in form of lanterns of different sizes and stars. In the terms of the gameplay, there is nothing much to be said, since it uses a pattern where a winning combination is formed of matching symbols placed from the left to the right side of the screen. 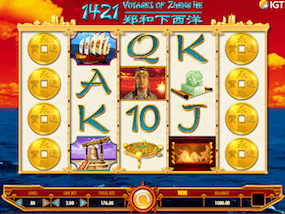 Play 1421 Voyages With $700 Free >>> Play Now! The red lantern works as the wild symbol, eventually replacing any ordinary icon on the reels. Lotus flower is the bonus symbol, helping you to trigger free spins round and also boosting your bankroll with the 2x multiplier for a combination of 3 more that appear practically anywhere on the reels. Collect 3 or more Bonus scatters appearing on the reels 1, 2 or 3 to trigger the Free Spins bonus round – a mini interactive round where you have to pick one of 3 lanterns and get anywhere between 4 and 14 free spins. When you get a winning combination in both base game and the free spins round, you can randomly trigger the Floating Reels feature. This time, all symbols that formed a winning combination will burst into flames and disappear from the screen. New icons will take their place and fill the empty reels with new symbols, boosting your chances to form a winning combination over and over again. Moreover, there is the Star Multiplier feature where each Star icon will make your winnings multiplied in a range from 2x up to 5x. This option is applicable on both base game and free spins winnings and you can even get more money when get 2 or more stars on reels 1, 2 and 3. When that happens, the multiplier values start with 2x, 5x and may go up to 8x. And finally, the progressive jackpot: Since the Star Lanterns belongs to the IGT’s MegaJackpots games, you can score the top prize when collect 4 MegaJackpots symbols on a single spin. This will happen when the Star fades away and reveal a MegaJackpots icon. The game will also give you the 2nd chance if the number of collected icons is not enough to trigger the jackpot. This is a progressive jackpot pokie machine where the total pool of prizes depends on the number of players that play Star Lanterns over the world, and their bets, of course. In addition to the main prize, you can also get more coins when hit 5 yellow lanterns appearing on an active paying line. 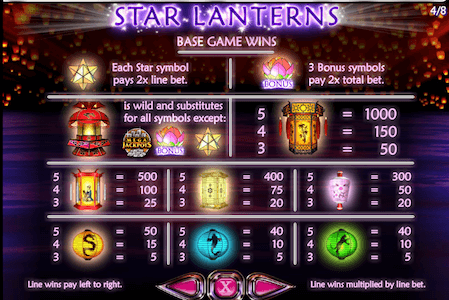 Inspired by the Chinese symbols for luck and wealth, Star Lanterns combines classic gameplay with progressive jackpot and interactive bonus rounds. Not only you can score the life-changing main prize, but also benefit from other rewarding features, which makes this game more than recommended to the players of all experience levels. 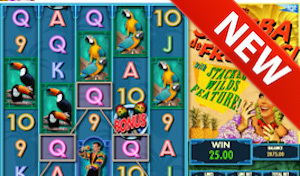 Play over 800 pokies from 12 providers with 10m+ in jackpots.